During his campaign, President-elect Donald Trump promised that he would take the side of American workers against economic elites when evaluating policy. Yet, the policy proposals he put forth during the campaign had nothing in them that would actually help working- and middle-class Americans. Now that more plans and potential cabinet appointments are coming into focus, it looks worse than many of us thought even before the election. Across a broad range of crucial issues, the incoming Trump administration appears likely to betray the promises he made to the American middle class. Here’s a rough sketch of how. Trump’s tax policy proposals are crystal clear about who will benefit the most—and it’s not working- or middle-class families. Despite crowing during the campaign about raising taxes on “hedge fund guys,” the tax plan Trump released raises one small tax on hedge fund guys (eliminating the so-called carried interest loophole), and then gives them a hundred times more back in the form of lower taxes everywhere else. The top 1 percent will get 47 percent of the total benefits in the Trump tax plan, while the bottom 60 percent will get just 10 percent. Worse, large numbers of working-class taxpayers will see tax increases under Trump. Yes, increases. Because that money is needed to make sure that private equity managers can see their top tax rates moved down to 15 percent. House Speaker Paul Ryan—who many (not least Speaker Ryan himself) think will end up crafting most of the actual policy to come out of the Trump administration—has a competing tax proposal. Apparently, he thinks it’s important to give an even higher share of tax cuts to the top. The Ryan plan lavishes 76 percent of its total tax benefits onto the top 1 percent of households (the top 0.1 percent, or the top 1/1000th of households, gets more than 47 percent). In the Ryan plan, the bottom 60 percent get less than 5 percent of the total benefits. A very large tax cut that delivers an enormous share of the benefits to the richest Americans—with an average cut of at least $1,100,000 to the richest 0.1 percent—will be one of the top priorities of both Trump and the incoming Congress. This should raise a clear red flag about just how much Trump actually cares about the bottom 90 percent. Another name that’s been floated for Treasury secretary is Anthony Scaramucci, who thinks that there has been an “irrational demonization of Wall Street over the past 8 years,” and that Wall Street is “filled with integrity.” As for the financial crash of 2008, Scaramucci is clear who is to blame—mostly not Wall Street. The culprit who needs more blame cast upon them, he says, is “frankly, Main Street. Many people overreached in their homes because there was easy money and easy credit.” He hopes the “nonsense” that Wall Street bears primary responsibility for the 2008 financial crash ends with the Trump administration. And he makes it clear that his personal opinion is that Dodd-Frank restricts banking risk excessively (making banking “too, too safe”) and should be repealed. He might slap large, arbitrary tariffs on imports from countries he doesn’t seem to much like, but this will do little to improve American competitiveness. In fact, if such tariffs encourage foreign producers to set up facilities in the United States to avoid tariffs, create economic weakness in our trading partners, and/or encourage retaliatory tariffs, they will increase America’s trade deficit. A prediction: presuming the economy does not enter recession in the next four years (and there’s no reason it should, absent a huge fumble by the Trump policymaking team), the American trade deficit will be larger, not smaller by 2020. No, we’re not at full employment today—largely because Republicans in Congress and in statehouses around the country have starved the economy of normal levels of spending during the recovery. Without this austerity, we would have reached full employment years ago. 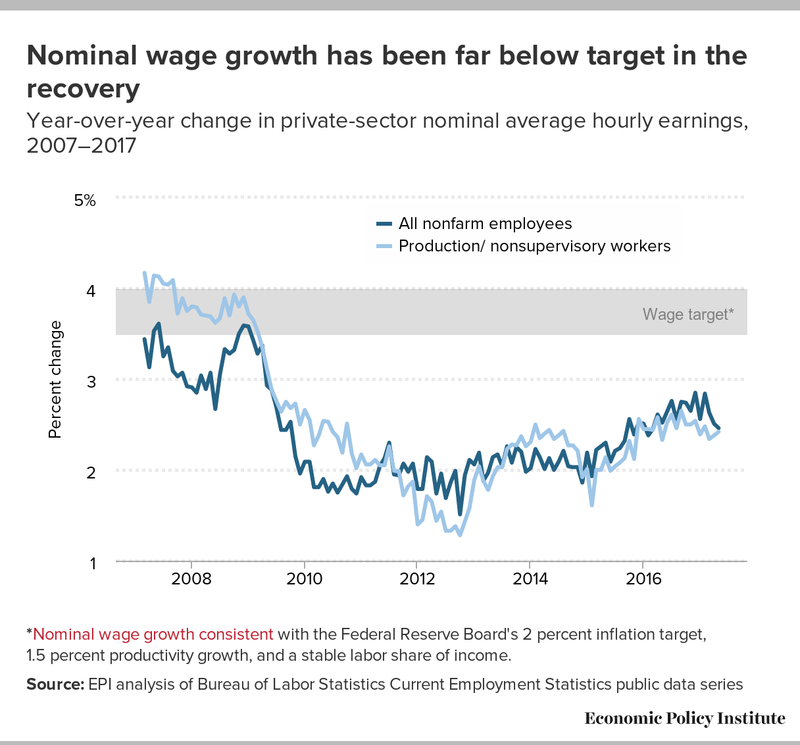 But even with no help at all from tax cuts or spending increases, the economy is projected to reach 4.6 percent unemployment or lower by the end of 2017. And now that Republicans are in charge, the austerity they forced on the American people will undoubtedly stop. A huge tax cut will add to purchasing power and demand growth in the economy. It will do so incredibly inefficiently, creating about one job for every four that could be created if this money was spent more intelligently. But job creation has to take a back seat as a goal to maximizing the take of the top 1 percent, so, tax cuts for rich households it is. Inefficient stimulus, but lots of it. A possible infrastructure plan would also boost growth, so long as its effectiveness was not compromised by the crony capitalism and poor targeting that would result from the Trump proposal’s very odd structure of giving tax credits to private investors, rather than just having state and local governments direct and finance projects. For those hoping that the Trump infrastructure plan would be aimed at helping struggling areas, it is worth noting that a key source of efficiency gains hoped for by the plan’s authors is that private investors are much more willing to cut off necessary services to households in economic distress. They approvingly note that privately-owned water and electrical utilities are much quicker and more willing to turn off services when households cannot pay bills than publicly-owned utilities.